Mills Nutrients offers a complete hydroponic feeding regime suitable for all grwoing mediums. 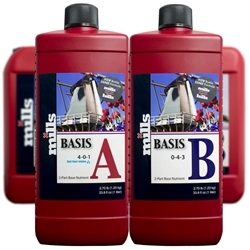 Mills Base feeds come as a two part formula to be used along additives that provide your plants with everything they need and nothing they don't; Mills is a pioneer in the field of bio-mineral plantnutrients, utilizing both synthetic and organic sources to optimize growth rates, yield, flavour, and aroma. We are UK distributors of the complete Mills Nutrient feed programme, offereing the best prices in large quantities. 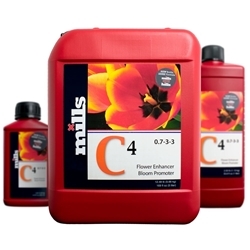 Mills C4 is packed full of Micro&Macro nutrients promoting quality and yield. 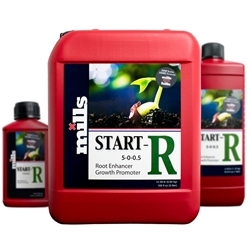 Start-R by mills is for use during the propagation and early bloom phase of the plant cycle. 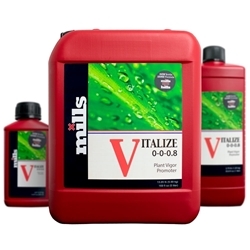 This Bio-Stimulant allows for excellent rooting and a strong vigorous root zone. Ultimate PK is ideal for the later stages of flowering, as it is Phosphite-based and therefore increases oxygen flow to the root. The Phosphite is readily soluble and this helps to stimulate root growth as well as harden cell structure.